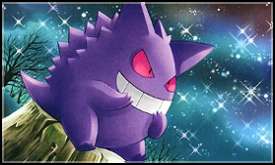 That mischievous, little ghost with the well-known grin has been with me ever since I started to watch/play Pokemon. As a funny matter of fact, Gengar was also the every first Pokedoll I owned, given to me by my grandparents. Good conditions for being my Pre-Elite4 Regular! Initally planned for my Gallade, after taking it's name "Creror" for my trainer ("crerora" is an old, latin portmanteau for both dusk and dawn) but it seemed to fit Gengar's darker theme more. Catched at the 13th July 2010 - My birthday in the year I started to assemble my team. Kind of a mix between Starter and Annoyer. Hypnosis is so versatile! John Kleckner from Hejibits can confirm that. with a splash of fine raging.